I’m so excited about Halloween this week. I just love going trick-or-treating with my kids and I love seeing all the kids in their adorable costumes. 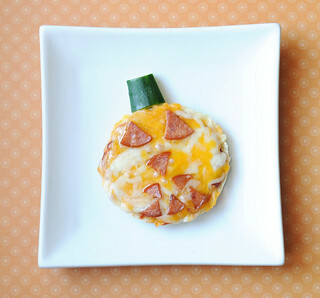 I’ve been busy making Halloween meals and snacks for my kids the last couple weeks and this was one of their favourites. We actually made them together and they just loved that. This pizza was handmade by my sweet little 5-year-old girl. It was great involving the kids in this process and I think it helped them enjoy it that much more. 2. On your english muffin half, spread on some pizza sauce. 3. Sprinkle lots of shredded cheese over top of the pizza sauce. 4. Take your pepperoni triangles and arrange them on your pizza – 2 for the eyes, 1 nose, and 5 smaller ones for the mouth. 5. Place on a greased baking sheet and bake until the cheese melts and the pepperoni cooks – about 10-15 minutes. 6. Remove from oven, allow to cool and place a slice of cucumber at the top for decoration. Happy Halloween everyone! I hope you all have a safe and fun night of trick-or-treating!